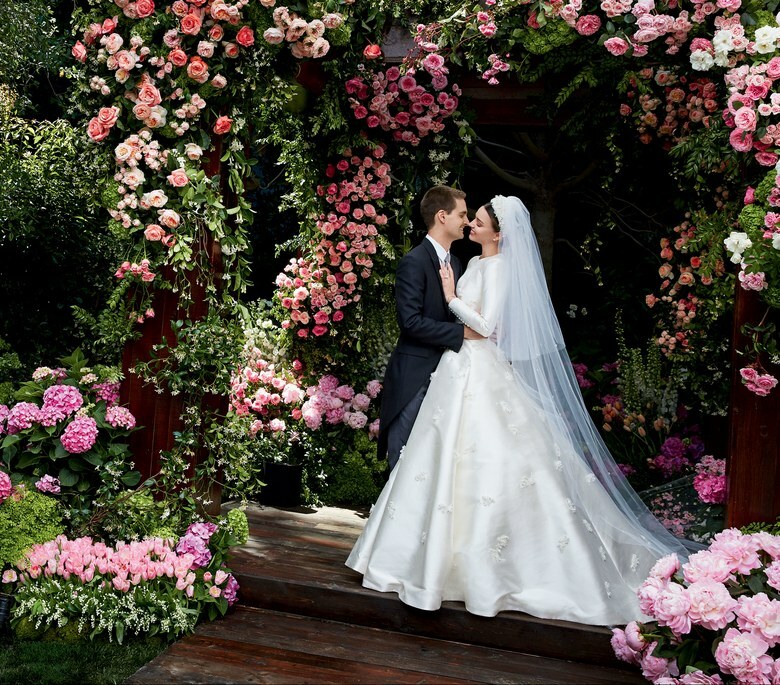 In beautiful celeb wedding dress news and pics just in, the official Miranda Kerr and Evan Spiegel wedding day photos are here. On a cool May morning, just as a cloak of fog began to lift off the western hills of Los Angeles, Miranda Kerr ran downstairs and put a chicken in the oven. If it seems odd that Kerr should be making dinner on her wedding day, consider the surprisingly intimate scale of the nuptials themselves: a cozy affair at home with 45 or so friends and family for one of the world’s most recognizable models and her fiancé, Evan Spiegel, whose company, Snapchat, boasts close to 200 million daily users. But there was no need to pity this busy bride, whose apron would soon be traded for Dior Haute Couture. She was cooking only for her husband-to-be (Kerr’s slow-roasted chicken scented with turmeric and lemon is among Spiegel’s favorite dishes), while the caterer replicated her menu for the rest of the assembled guests. We think Miranda looks divine! This is the second wedding for Miranda, and the first for Evan, who is the founder of Snapchat. Miranda has a son named Flynn with her ex-husband, actor Orlando Bloom. Miranda is 34, and Evan, 26, and they became engaged last July and got married two month ago, in late May in a small ceremony in the garden of their $16 million Brentwood mansion. There was no bridal party except Miranda's six-year-old son, who was a ring-bearer. Miranda sang 'You’re Still The One', a hit recorded by Shania Twain, in footage obtained by gossip and news site TMZ. The couple has a personal combined value of more than $6.7 billion. They met in 2014 at a New York dinner party and started dating a year later.